The RoadWatch system is a simple and straightforward tool in accomplishing these tasks to improve the bottom line either through reduced accidents or improved management of conditioning agents or paint. The system can be integrated with dispersal controls and other systems to feed the needed data to achieve the needed results. Whether you are looking out for situations where the road surface is too cold or too hot, RoadWatch can give you the data needed accurately while moving. 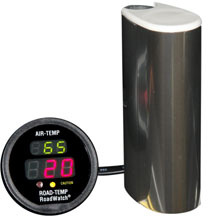 More than a simple thermometer, there are a few who mimic but none that replicate RoadWatch. The RoadWatch system is an unmatched system when it comes to providing vehicle operators crucial surface temperature information. Whether you need the temperature to know when to stop driving, use the information to adjust the type and mixture of “salt” spreading, or need to know if the surface is the right temperature to allow paint to adhere properly the RoadWatch system is the best solution. Simple and durable construction which is flexible to allow mounting in many locations, our complete kits will get you up and running quickly. Our experience with complete vehicle cab solutions, inside and out enables us to bring you a rugged and durable system that is built to work hard. The system comes calibrated for life, so you don’t have to waste valuable checking and adjusting the unit.